It’s easy to despair when seeing Syria today, but to honour the dead, we must carry forward the hope they died with. 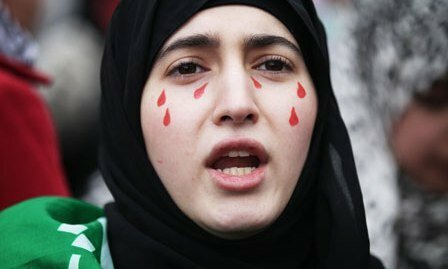 As Baba Amr went dark and fears of massacre spread, Syrians took to the streets — yet again — across the country, in a peaceful protest that showed staggering bravery. Our team in Beirut has also provided a valuable communications hub for brave and skilled activists to coordinate complex smuggling operations and the rescue of the wounded and the journalists. Avaaz does not direct these activities, but we facilitate, support and advise. We have also established safe houses for activists, and supported the outreach and diplomatic engagement of the Syrian National Council — the opposition movement’s fledgling political representative body. Much of the world’s major media have covered Avaaz’s work to help the Syrian people, including features on BBC, CNN, El Pais, TIME, The Guardian, Der Spiegel, AFP and many more, citing our “central role” in the Syrian peaceful protest movement. Today, a dozen more nightmares like that visited on the city of Homs are unfolding across Syria. The situation will get worse before it gets better. It will be bloody, and complicated, and as some protesters take up arms to defend themselves, the line between right and wrong will blur. But President Assad’s brutal regime will fall, and there will be peace, and elections, and accountability. The Syrian people simply will not stop until that happens — and it may happen sooner than we all think. Every expert told us at the beginning that an uprising in Syria was unthinkable. But we sent in satellite communications equipment anyway. Because our community knows something that the experts and cynics don’t — that people power and a new spirit of citizenship are sweeping our world today, and they are fearless, and unstoppable, and will bring hope to the darkest places. Marie Colvin, an American journalist covering the violence in Homs, told Avaaz before she died, “I’m not leaving these people.” And neither will we.